Product prices and availability are accurate as of 2019-04-15 20:26:23 UTC and are subject to change. Any price and availability information displayed on http://www.amazon.com/ at the time of purchase will apply to the purchase of this product. Safety at night: Made of reflective material, the harness makes your dog visible in dark, keep your dog's safety while out for walking at dawn, dusk, night or foggy and rainy days by reflecting lights.? 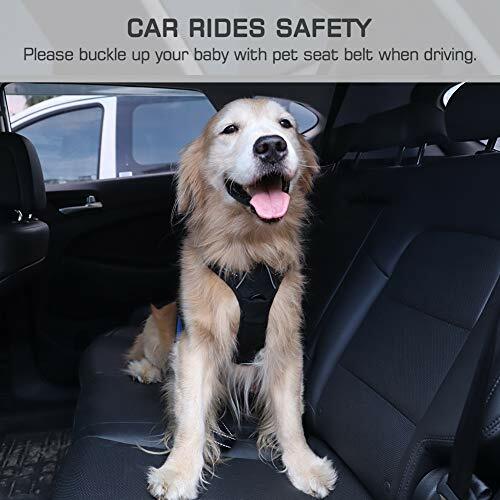 Safety in the car: Please buckle up your baby with pet seat belt when driving, it can keep your dog securely in the car if you stop suddenly. No pull and no choke: Fully padded on the chest and back, the Auparto dog harness is designed to pulling pressure evenly distributed to the body to prevent pulling and choking and injuries. Adjustable Neck and Chest Girth: Fully adjustable straps at the chest and neck allow a custom fit for your fur friend. Keep your dog from dragging you: With our harness, no tension at all on the leash. You can walk without your baby pulling you or dragging you down the road. 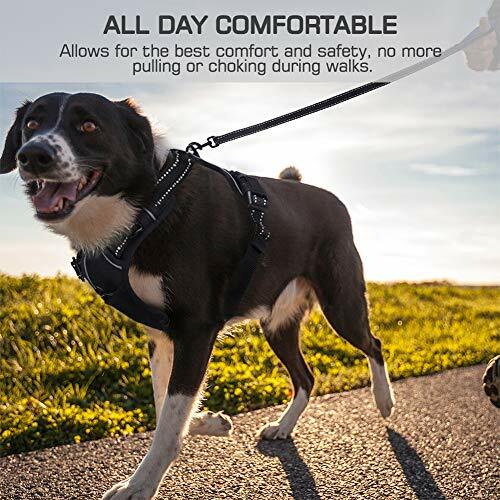 2 metal clips: Two sturdy metal leash attachment points with reinforced webbing, front clip for discouraging pulling and back for relaxed walks. Study back handle: grab handle to help you to control and assist your dog in a crowd or have accidentally a bigger dog situation. Quick snap buckles design: Snap buckle on both sides of the harness ensure simple put-on and take-off. All weather vest: Made using breathable mesh fabric, this pet harness is ideal weather all year-round. Easy to clean: Made breathable mesh fabric, our dog vest is easy to hand wash and also can wash in a machine when dirty. JUST FIT WELL: M size harness for 22-27 inch dog chest girth. This M dog vest is a perfect size for medium dogs, like Collie, Keeshond,Labrador Retriever, Poodle, Boxer and more. 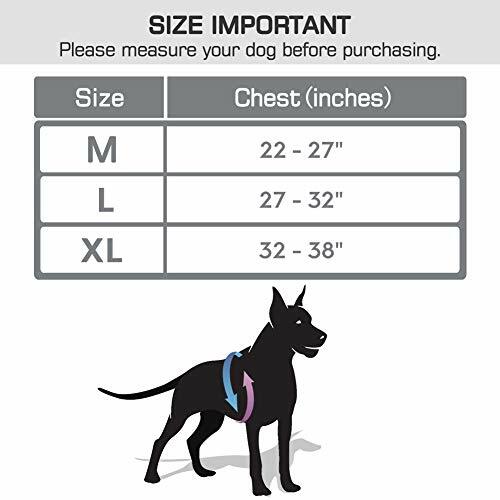 Please measure your dog¡¯s chest girth according to our size chart. STURDY BACK HANDY HANDLE: The grab handle on the back is sturdy enough that you can easily grab your baby and protect him when you are in a crowd or have accidentally a bigger dog situation. 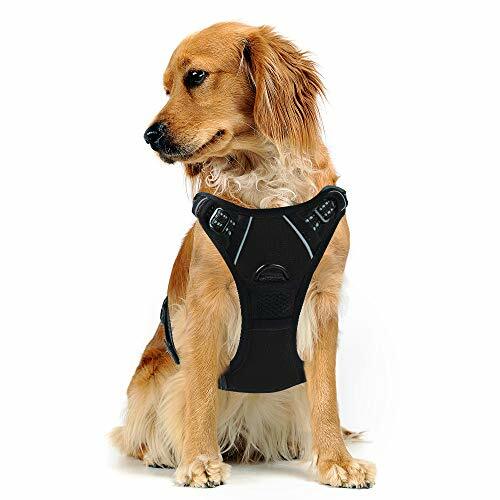 NO PULL DESIGN: The pulling pressure is evenly distributed to the dog's body to prevent pulling and choking with the soft sponge padding in chest and belly. Breathable mesh lining with soft sponge padding plate of our pet harness prevents dog injuries, giving extra comfort and protection. This comfortable harness can also help you better control for keeping your baby from totally running off and dragging you along. 2 METAL D-RING: Two sturdy metal leash attachment points on dog's chest and back, The font loop is great for handling on walkies, while the back loop is great for long-lead play. 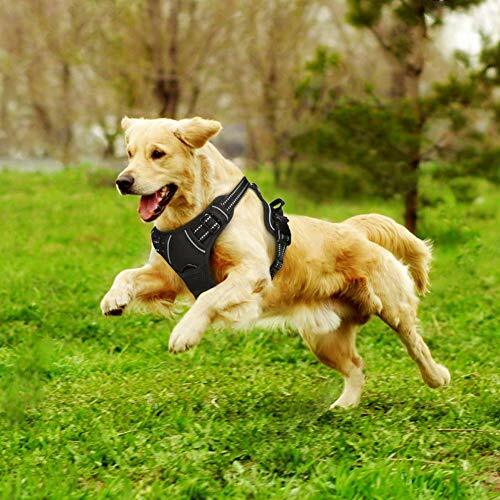 This easy dog harness is perfect for daily walking, running, hiking, training, hunting, outdoor adventure and more! 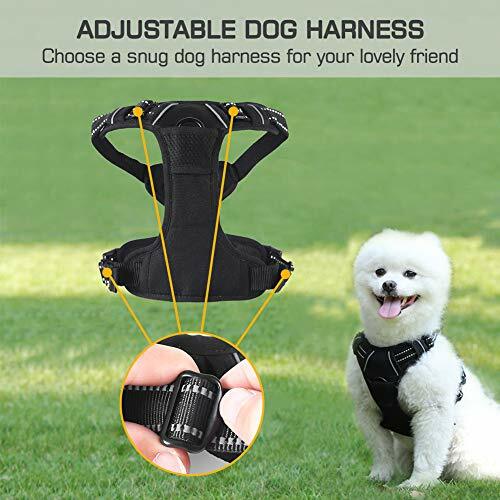 EASY ADJUSTMENT AND PERFECT FIT£ºPet harness with quick snap buckles ensure ease of use when putting on and taking off; Fully adjustable straps at the chest and neck allow a custom fit for your fur friend; There is no problem for your growing dog.